HURRAY CAD-a-Blog! We have finally made it to 200 posts. Wow! I didn't know that I posted that much. I wasn't planning anything special. In fact I found out by accident. CAD-a-Blog has come a long way and I give the credit to my many readers. You are always providing me with great feedback and questions, and you are still visiting. I ran into a dry spell this past December and early January when my computer was down (very evil malware) and when my family and I went on vacation for a while. I want to say thank you for every visit, comment and e-mail. CAD-a-Blog has an average of 350 visits every weekday with about 150 each weekend day. Not bad. Remember that you can sign up for either a free e-mail alert or the RSS feed (top right hand corner of the page). I recommend doing this so that you can be alerted to every new post. That way the tips come directly to you, no waiting, and no hunting. You can also add me as a follow on your Twitter account. All of my posts are logged there too. Also, take a look at the STORE for some great CAD related t-shirts, mugs and more. I have plans to expand this section in the future so visit early, visit often and buy something. The great thing about the store is that if you don't exactly like the product, you can customize it to better fit your needs. I am really excited to announce that next week I will be attending Autodesk's AutoCAD 2010 Backstage Pass!! Yes, Autodesk invited me to attend their big party announcing the release of AutoCAD 2010! I have been fortunate enough to been a member of both the Alpha and the Beta teams that have tested and used AutoCAD 2010. Once I get the ok from Autodesk i will be able to start bloggin about it. I can't wait. I will be blogging about the event next week. It will take place on Thursday, Febuary 5th. I will even be reporting on through my Twitter account, so make sure to add me as one of your FOLLOWS. I am very excited to be a part of this event and look forward to sharing it with you. Oh, and Happy Birthday AutoCAD. AutoCAD can be very expensive. AutoCAD LT is still on the expensive side, especially if you don't need all of that power. What can you do if all you need is to create simple sketches? They are 3D models, so Google's free version of Sketchup is priced right, but it's not what you want or need. Autodesk has an online product available called PROJECT DRAW. Project Draw provides a vector based 2D drawing platform that runs through your web browser. There is no software to purchase, no updates, no patches to maintain, etc. If you have a web browser and internet access you can use it! Project Draw has the ability to draw basic shapes, many of them predefined. You can also draw lines, add fills, etc. As you can see, with these shapes, users can quickly create a basic layout to give to a contractor, engineer, architect, or permit coordinator to convey your needs and wants without having to spend thousands of dollars and years of training for a complex design program. I drew this character in about one minute using different shapes and fills. Ok I won't win any awards for this, but perhaps in the hands of a creative artist something great could be drawn. In the case you want to draw something a little less abstract, you do have dimension controls when drawing a shape. In the screen shot below, I started on the FLOOR LAYOUT basic shapes and inserted a square room shape. You are asked to insert the dimensions for the the sides, or you can drag the edges of the shapes like grip editing in AutoCAD until the sides are at the length you want them to be. You also have control of what type of units you are using in the drawing as well as the page size. You have two choices, imperial (inches) or metric (millimeters). If you draw a shape in inches but now want to switch to millimeters, go ahead. Project Draw automatically knows the difference. A five inch object will automatically convert to 127 millimeters, for example. I mentioned earlier that there are different sheet sizes to choose from. When working in imperial units, you can choose from ANSI or ARCH A, B, and C sizes. They also have legal, 8"x10" and 30"x 42". If you don't like those settings, enter in your own, like 24"x36". The metric units have ISO A2, A3, A4, and A5. But again, you can still enter in your own size in millimeters. Many of the features mentioned above are accessible from the Properties Window. When an object is selected, the properties for that object will be displayed. Here you can change its size, rotation, and insertion point. These same variables can be changed directly on the shape through grip edits. But this feature allows you to accurately draw your shapes to the size you want to. They are just randomly drawn lines that you guess is the right size. 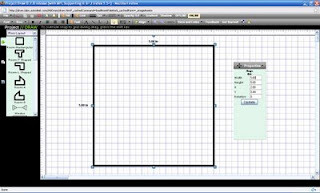 The properties window controls the drawings units, paper size, grid controls (on/off and size), snap to grid, scale of drawing, ruler on/off, and guidelines. One issue with the scale of the drawing. Make sure you set it first before you start drawing otherwise it seems that the drawing objects will also scale! Project Draw is a very versatile, free, and simple program to use for basic sketches and design documents. It has many possible applications in many different genres. I recommend that you check it out. You may find that it would be a useful tool for many people. Shaan Hurley, Platform Technology Evangelist & Beta Programs Manager for Autodesk has a blog, Between the Lines. On his January 23rd post he spoke about navigating in AutoCAD using the Fly and Walk features. I wanted to pass along that post as I feel they are great ways to get around in a file. They are also great ways to quickly and easily create an animation for a presentation. Steve Johnson, writer of BUG WATCH for Cadalyst magazine has a great article this month on how to improve the performance in AutoCAD 2009. AutoCAD 2009 gave us several new features that often get in the way and Steve talks about handling them in a way you may have already figured out. He also goes into the 2 Service Packs that have been released from Autodesk. The first issue of AUGI Hotnews for 2009 is out. Check out my column, Techniques this month. It is about the Zoom Command. Mark Kiker, AUGI president, reviews AUGI's 2008 accomplishments and gives members an update on the year ahead. Do Revit Users Need User-Generated Content? A recent survey illuminates the issues involved in finding quality Revit content such as families. This article examines the survey results and highlights some options for obtaining user-generated content. Brian Benton explores the number of ways that AutoCAD users can zoom around their drawings. If you haven't used zoom lately, you may be surprised at the versatility of this AutoCAD feature. You'll learn what it does and how it works in this article. Mark Kiker continues his exploration of the CAD manager's mindset or "world view." This month, you'll discover the many benefits of a mind set on Action and Results. The Civil Side: How Do Civil 3D and BIM Relate? Join columnist Melanie Santer for this in-depth look at how to incorporate BIM into civil engineering projects via AutoCAD Civil 3D software. Meet HP Blade Workstation solutions, which allow Autodesk software users and administrators to centralize all their workstations in a single data center where they can be properly secured and maintained. In this lesson, AutoCAD Architecture expert Tharakesh Ananthakrishnan teaches you how to add components to a wall style. The goal of every user of 3D solid modeling software is to create models that are stable, predictable, and easy for others to modify in the future. Here's a look at how to avoid taking shortcuts in design that will cause issues later on. Mark Kiker, President of AUGI's Board of Directors, has released the article, AUGI Status Report, discussing the state of AUGI. He discusses AUGI's achievements in 2008 and provides some insight into how AUGI will be starting 2009! To bring yo up to date a bit on AUGIWorld, it seems to be back on as I recieved word yesterday of the dedline for my next article for that publication. AND Hotnews has not stopped production. Way to go AUGI. 15 years of hands-on experience in mechanical, structural and civil/Survey design/drafting/modeling. If you or your company need CAD assistance please contact me. I can provide CAD assistance VIA telecommunication to help you maintain your software or to conduct training one on one or in a group. I would like to tell you about another online resource for CAD users. It is CAD Forum. It is an online forum discussing CAD issues and procedures. I have found help there and I have been able to provide help to others too. CAD Forum is a Czech-based website available also in English and German. It contains 1.600+ free CAD tips and tricks for AutoCAD, Civil 3D, Revit, etc., discussion forum, CAD blocks library (incl. 3D blocks), free utilities and other CAD resources. Do you need blocks for a drawing or project don't don't have the time to make them yourself? There is a website that I have used many times for a quick block fix. It is the CAD Block Exchange Network. The site asks its users to upload files they have created in order to share with others. It has a search ability and is organized by category. I recommend it. In AutoCAD 2009, we were given the Ribbon and the Action Recorder. The Action Recorder is great for recording repetitive actions and tasks. The Ribbon is great for accessing grouped commands and saving screen real estate. One of my readers asked me how to use the Action Recorder without using the Ribbon. Well, you can't. You can start recording, stop recording, and play back other Action Macros but you can not edit them. This is a big deal to me. If you have tried creating a macro to use, or for other people to use, they need to be edited. Turn on the ribbon and minimize it. There are three options to display the Ribbon: Full Size (displays the ribbon and the tabs), tabs and panels (displays the tab names and panel names only), and tabs only. Doing this will take up more screen space but it will give you access to the ribbon and the features that are only in the Ribbon. If you don't use the features in the ribbon enough to justify having it displayed that way, I understand. You can toggle the ribbon on/off by typing on the command line: RIBBON. That way you can create a macro with the Recorder and then edit it. Its a pain I agree, but if you don't want to use the ribbon in your daily work, you will have to turn it on to use some of the latest features in AutoCAD. Autodesk will cut 750 jobs in order to save millions of dollars. I know how these individuals feel.